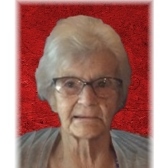 Mabel Fleece, 94 of Zanesville died at 6:02 PM Saturday, July 21, 2018 at the Genesis Morrison House Hospice. She was born December 20, 1923 in Summers County, WV. Mabel loved gardening & mushroom hunting and spending time with Abbi. She is survived by two daughters; Bonnie (Bob Ogg ) Stoops and Teresa (Mark) Tobias; her favorite granddaughter, Abbi (Rommie Gibbs) Stoops; 3 great grandchildren, Ava, Leelend and Rileiy; a sister Bonnie; and a nephew Randy Morrison. Mabel was preceded in death by her parents; her husband, Charles Fleece; a son and a daughter and two sisters. Mabel's wishes was not to have any visitation but to have a graveside service which will be held at 1:00 PM on Thursday, July 26th , 2018 at St. Paul Cemetery, Sonora with Pastor Wes Kidwell officiating. The Bryan & Hardwick Funeral Home, 2318 Maple Ave. Zanesville is in charge of the arrangements. To share memories and condolences with Mabel’s family please click on the Guest Book link on this page.